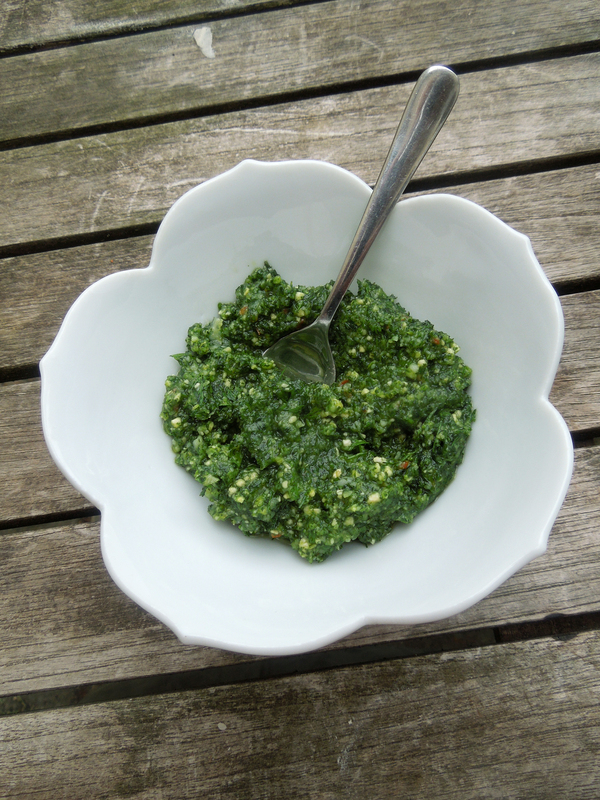 Normally I make pesto the traditional way, or at least with the traditional ingredients of basil and pine nuts – I don’t pound it by hand with a pestle and mortar although it would probably taste even better if I did. But I’m obliged to Rachel Roddy of Rachel Eats, whose recent blog post reminded me that it’s perfectly possible to ring the changes. Check out her new book, Five Quarters, which is my current bedtime reading and makes me want to move to Rome, preferably as Rachel’s lodger. This isn’t one of Rachel’s recipes but looking at our feathery row of coriander, which is rapidly going to seed all over the veg patch, I decided to make the most of a generous crop. 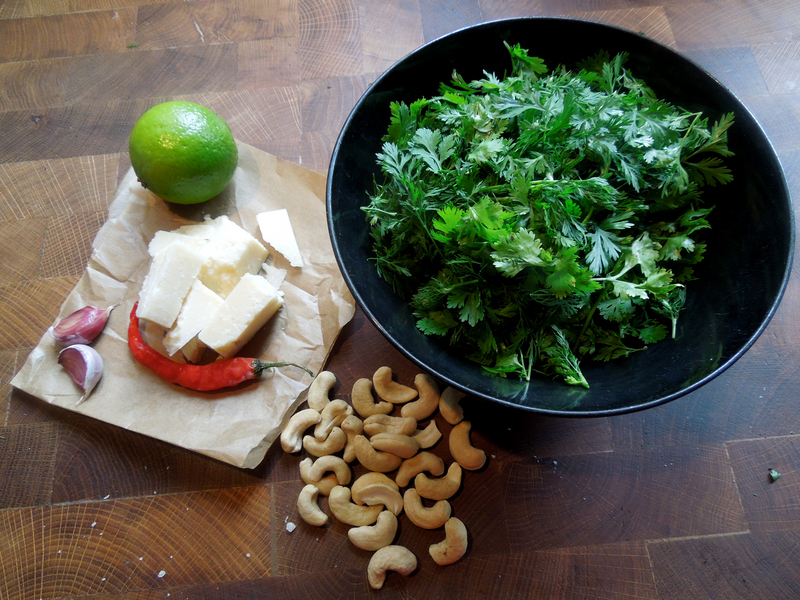 I think coriander’s lemony/spicy taste blends well with the creamy sweetness of the cashews. The chilli gives it just a tickle of heat. 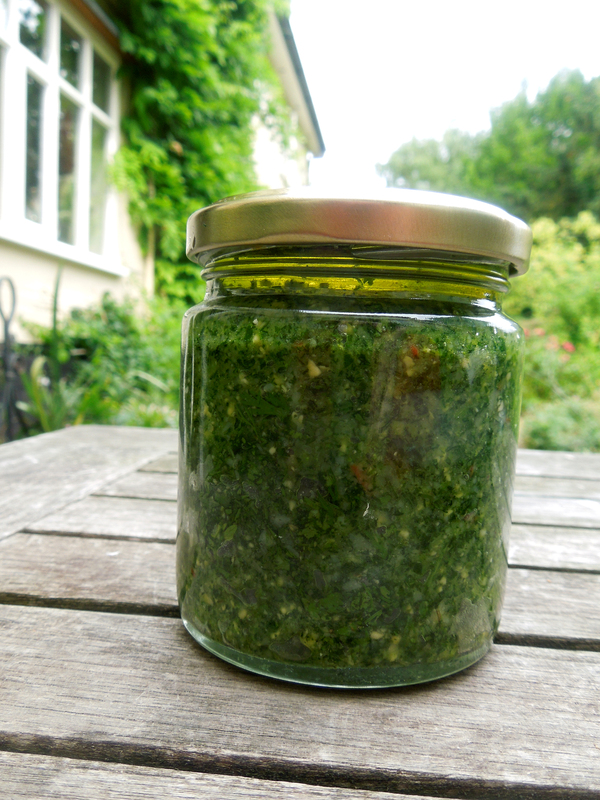 ‘Zingy’ is an over-used adjective (guilty as charged) but this pesto really does have pizzazz. I cleaned out the bowl with my finger like a five year old let loose on the cake mix. I dolloped some on a couple of oven-baked sea bream, which we ate with new potatoes from the garden and Norfolk samphire. East Anglia meets Italy via the Far East. It sounds daft but it worked. And – though I simply can’t bring myself to buy a spiraliser – this would also be very good as a dressing on a raw courgette salad. In the absence of said spiraliser, just cut the courgettes thinly with a vegetable peeler. Or try the pesto with griddled veg. You could even put it on pasta. I use a food processor to make pesto, but as Rachel points out, you can also use a stick blender or a pestle and mortar. This is the method I used. Put the cashew nuts in the bowl of the food processor and give them a quick whizz to break them up a bit. Add the coriander leaves, the garlic and chilli and a pinch of salt. It may sound superfluous to chop the chilli and garlic before you process them but it means they get incorporated quickly without you over-processing everything else. Pulse the mixture briefly so you have a thick grainy paste and grate in two or three rasps of lime zest. Now add the cheese and oil in batches until you achieve the flavour and consistency you want. This is one of Rachel’s tips and I think it helps the texture of the pesto. Alternatively you can stir in the parmesan at the end. You can store this in a jar in the fridge as long as you float a layer of oil on the top to keep the air out (and the colour in). It also freezes quite well. This entry was posted in Sauces, Vegetarian and tagged coriander and cashew nut pesto, Five Quarters, Pesto, Rachel Roddy by Linda Duffin. Bookmark the permalink. However, your pesto sounds great. I like non-traditional pestos as much as the original – my personal favourite involves walnurs and parsley – so I’ll certainly give this one a whirl. Yes, it’s a lovely book, I like her writing and her recipes. As for lodgers, she could probably open a guest house at this rate. 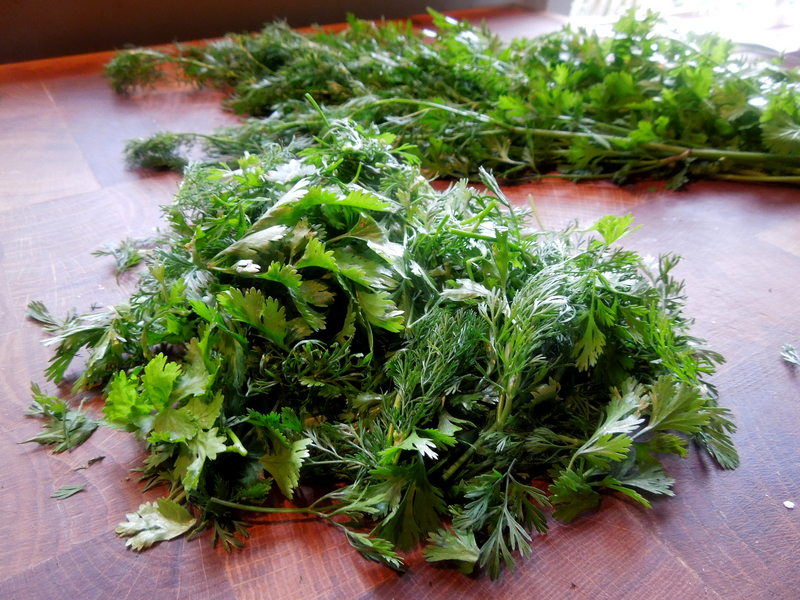 Do give this a try – it’s very good with really fresh coriander from the garden if you have it. Will have to have a go at walnut and parsley too, my end. That is a pretty zingy post Linda. Lovely pesto.